Feminism Club has two basic rules: 1. Talk about feminism. 2. Don’t be a jerk. The club is new to Concordia’s campus this year and executive board members Katie Beedy, Rachel McCloud and Natalie Dulka aim to create a safe space to have conversations about what feminism is, why it is important and whom it includes. Executive borad member Natalie Dulca shares coffee and thoughts with Caleb Christiansen, Noah Bray and other club members during the Coffee and Tea intersectional event for Feminism Club. Photo by Maddie Malat. Beedy, McCloud and Dulka met their freshman year at Concordia and often talked about the need for a feminist organization on campus. Their sophomore year, they moved in together and continued to have the same conversation. Dulka eventually took the initiative and filled out an application. After piles of paperwork, a feminist manifesto and an interview with the Student Government Association, McCloud, Beedy, and Dulka had a new club on their hands. “When we got our verification it was just all of us screaming and like eating popcorn and chugging coffee, because that’s pretty much our life: feminism, coffee, popcorn and yelling,” McCloud said. Feminism Club meets twice a month and does not have a set meeting time. Instead, they run a Facebook group and post the date and time of each meeting in advance. The club encourages people who do not know what feminism is and people who do not consider themselves feminist to come to their meetings and participate in discussion. “I just think that it’s good, if it can happen in a well-mannered and civil way, to have different opinions and see both sides of the story,” Beedy said. 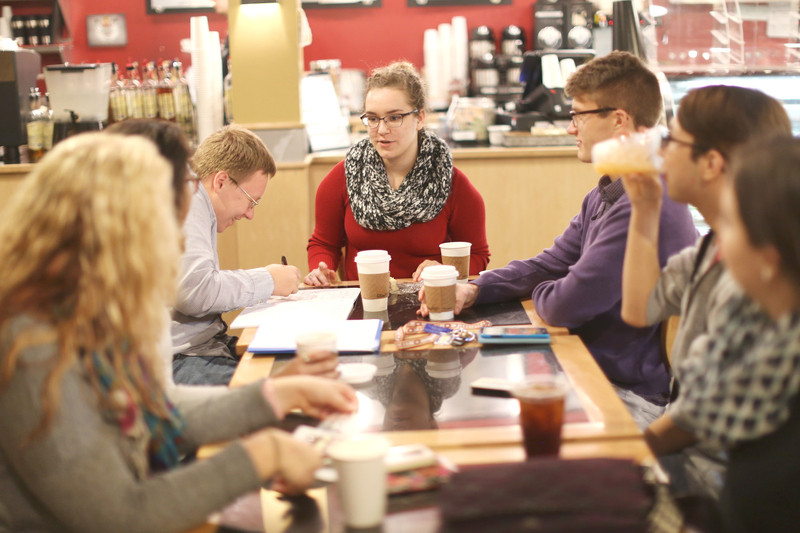 The club also encourages men to come to their meetings, as they stress that feminism is not just a women’s issue. The group has established four different events that they will continuously cycle through at the meetings: Coffee and Intersectionali-Tea, Anecdotal Feminism Forum, # feminism and Sit Down, Shup Up, and Listen. Coffee and Intersectionali-Tea is hosted at a coffee shop and addresses intersectional feminism, which examines how the oppression of women is directly related to the oppression of different genders, races, classes, and abilities. The rest of the events are held on campus. The Anecdotal Feminism Forum is an opportunity for students to share their personal stories or ask questions and #feminism is a time to discuss how feminism is portrayed in the media. Sit Down, Shut Up, and Listen is a lecture-style event that will feature Concordia professors and other guests. Breck Cogswell and feminist club members listen in as Cole Cymbaluk talks about this weeks topic at their event Coffee and Intersectionali-Tea. Photo by Maddie Malat. Associate professor of religion, Dr. Hilda Koster, serves as the faculty advisor for Feminism Club. Koster said she became a feminist while she studied theology in the ‘80s, just as feminist theology was beginning to take off. “When you are studying to become a minister, [feminism] is hard not to think about,” Koster said. Koster recognized that although she could study theology, she could not become an ordained minister in most religions, because the position was, and largely still is, reserved for men. “I can study all I want but I will never have access,” Koster said. Like Koster, members of Feminism Club have their own stories about how they became a feminists. McCloud said she grew up in a conservative household where her father made the rules and her mother cooked and cleaned. McCloud did her homework and whatever she was told. Then, she turned sixteen and realized that not all homes operated the way hers did. Her ideas about her role as a woman in society began changing, and after graduating high school she took a gap year and began to figure out what she stood for. In the course of that year, McCloud became a vegetarian, an atheist, and a feminist. Beedy has a much different story. She grew up playing sports, digging up worms, and having burping contests with the kids at daycare. Feminism was never on her radar, until two summers ago, when she performed in “bare: a pop opera,” which raised issues of social justice that Beedy had never been aware of. In the following years, Beedy began to form ideas about her beliefs and learned more about feminism and the feminist movement. After meeting McCloud and Dulka, she firmly established herself as a feminist. “I had a title to put on all the beliefs that had been growing for the last few years,” Beedy said. Now, Beedy is particularly interested in how her role as a feminist can help people with mental illnesses, while McCloud is invested in LGBT+ issues and Dulka is inclined to examine issues of race and ethnicity. “Ultimately, we want to create a safe space to have informational conversations about what feminism really is, because there’s a lot of confusion…” McCloud said. Students interested in attending meetings can request to be added to the Feminism Club group on Facebook. 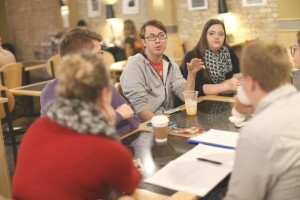 “I think it can re-energize students around issues that have to do with gender,” Koster said.